The Big Ten went 8-6 in the opening week of the college football season, but overall it was not a good weekend for them. 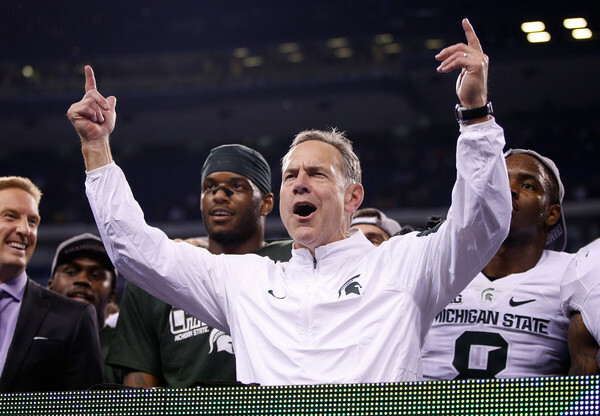 Week two was a good chance for the Big Ten to redeem themselves. A closer look at each of the Big Ten’s teams is below. Jim Harbaugh’s first game in the Big House did not get off to a good start. The Beavers took the opening drive and marched right down the field to take a 7-0 lead. It got worse when quarterback Jake Rudock lost a fumble on the Wolverines’ first possession and put Oregon State in position to add to their lead. The Michigan defense stepped up to force and recover a fumble two plays later while the offense turned it into a field goal. Michigan looked more like Michigan after that first drive by not allowing another point the rest of the game. De’Veon Smith was effective at rushing the ball and was more decisive as well. He finished with 126 yards and 3 touchdowns on 23 carries. Rudock went 18 of 26 for 180 yards, but did not have a touchdown pass and threw an interception. The Michigan defense allowed a total of 138 yards the entire game and 79 of those yards came on Oregon State’s opening drive. They were disruptive and all over the field for nearly all of the game. The defense gave up only one third down conversion to the Oregon State offense out of 11 attempts. 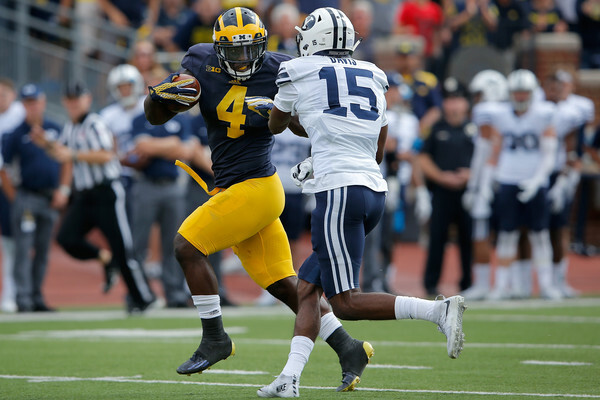 The Wolverines face UNLV next week at home with a chance to continue improving on both sides of the ball. The departure of Tim Beckman had no effect in week two as the offense continued to shine. Wes Lunt went 33 of 46 for 316 yards with a touchdown and an interception. His top target was Geronimo Allison who had 8 receptions for 124 yards. Marchie Murdock had a solid game with 6 catches for 51 yards and a touchdown. One area that the offense struggled in was holding on to the ball. They had four turnovers in total with three of those coming on lost fumbles. Obviously it did not hurt this week, but a similar performance against better competition will have disastrous consequences. The Illini also had 147 yards rushing and 2 touchdowns on 40 carries as a team, which does not even average to 4 yards a carry. That will also need to improve. The defense pitched a shut out and gave up only 141 yards of offense to Western Illinois. They allowed just 43 yards through the air and intercepted two passes. It was a suffocating performance that bodes well for them. Illinois looked good for two weeks, but the waters get very deep next week on the road at North Carolina. That will be a great test for Illinois on both sides of the ball against their highest quality opponent to date. Maryland had a second half surge to beat Richmond last week and it looked like they were going to do well against Bowling Green this week. The Terps led 13-6 at halftime, but struggled mightily in the final 30 minutes. The defense for Maryland was the biggest culprit as they gave up 42 second half points. They allowed 491 yards and 6 touchdowns through the air while giving up another 201 yards on the ground. They managed just one turnover and allowed 10 of 22 on third and fourth down conversions. Perry Hills did not have a good game going 15 of 30 with 168 yards and 2 touchdowns through the air. He threw three interceptions, but did run for 94 yards on 8 carries. William Likely was a bright spot again with an 85 yard touchdown return on a punt. Maryland has a third home game in a row next week against South Florida, but that will not be easy if they continue to struggle. Penn State was atrocious in week one against Temple, but rebounded to beat Buffalo at home this week. However, it was not always pretty as they continued to struggle on offense. Christian Hackenberg went 14 of 27 with 128 yards and a touchdown. He and the offense would not score until midway through the second quarter, but built a familiar 10-0 score. Buffalo made it 10-7 on their second drive of the second half, but the offense was able to do enough to put the game out of reach. Hackenberg was not sacked at all against Buffalo after being sacked 10 times in week one. Saquon Barkley had a good game with 115 yards and a touchdown on 12 carries while Akeel Lynch was stifled at times gaining only 46 yards on 19 carries. This duo was able to move the ball at times while the passing game was ineffective under Hackenberg. The Nittany Lions’ defense was solid allowing only 274 yards of offense to Buffalo and only 69 yards on the ground. They did not force a turnover, but were solid for most of the game. Penn State kicks off their Big Ten schedule with a home game against Rutgers next week. Wisconsin was in fine form in week two after their tough opening week game against Alabama. Week two provided Miami (OH), which was a welcome relief as the Badgers crushed them. Corey Clement did not play this week due to a lingering injury, but it did not matter with Joel Stave slinging the ball around. The running game struggled early on, but eventually got on track as the Redhawks wore down. Dare Ogunbowale ran for 112 yards and a touchdown on 16 carries while Taiwan Deal had 45 yards and 2 touchdowns on 14 carries. Stave looked sharp again this week going 19 of 30 for 236 yards with 3 touchdown and an interception. His best target was surprising with Robert Wheelwright leading the team. He had 6 catches for 79 yards and 2 touchdowns with the bulk of the catches coming late in the second quarter. Alex Erickson had 5 catches for 73 yards, but was also effective on punt returns with 72 yards on 4 returns. The defense, as expected, was dominant. They held Miami to -3 yards rushing and a total of 157 yards. They forced four turnovers including two picks Leo Musso and one interception by Tanner McEvoy. McEvoy got snaps at wide receiver as well in this game catching 3 passes for 29 yards. It was a much better performance, but the run game will need to find its feet quicker and not rely on Stave too much to get the offense going. The Badgers will have Troy in town next week. Ohio State had a quick turnaround from Monday night’s win over Virginia Tech and it may have played a part in their lackadaisical effort at times. Cardale Jones started the game, but struggled for the first quarter and a half. He was pulled in the second quarter with J.T. Barrett taking over. Neither quarterback was overly impressive with Jones going 12 of 18 for 111 yards and Barrett going 8 of 15 for 70 yards. Neither threw a touchdown or interception. Ezekiel Elliott was relied on more heavily this game going for 101 yards and 3 touchdowns on 27 carries. 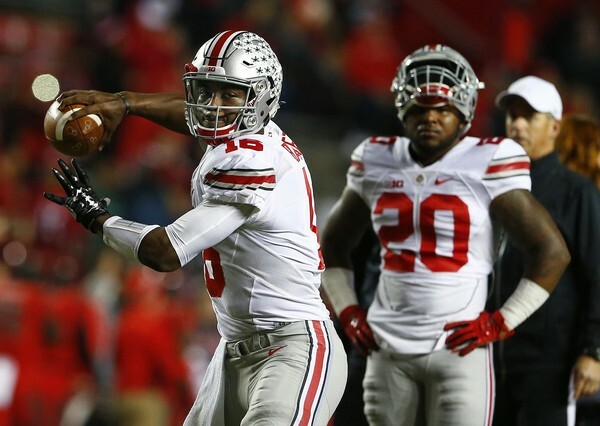 Braxton Miller, to no surprise, was used as well with 8 carries for 57 yards, but was held to 2 catches for 16 yards. Curtis Samuel finished as the leading receiver with 7 catches for 53 yards and Michael Thomas had 52 yards on 5 catches. The defense was very good by allowing only 165 total yards with 85 of those coming through the air and 80 on the ground. They forced four turnovers (2 interceptions and 2 fumbles) and returned one of those fumbles to the house courtesy of Vonn Bell from 14 yards out. The Buckeyes will certainly be looking to get more a rhythm next week at home against Northern Illinois. It looked like Rutgers was going to pull one out for the Big Ten, but a wild fourth quarter saw these two teams combine for 39 points including touchdowns from each team in the final 1:31. Kyle Flood opted to play Chris Laviano against the Cougars and he was decent. He finished 23 of 29 for 204 yards with a touchdown, but threw an interception that led to a field goal. He was able to spread the ball around finding 10 different receivers with Janarion Grant leading the way with 5 catches for 65 yards. Josh Hicks led the team in rushing with 91 yards on 16 carries while Robert Martin ran for 61 yards and a touchdown on 9 carries. The obvious weakness this week was the defense that was shredded by Washington State’s air raid offense. Luke Falk went 47 of 66 for 478 yards with 4 touchdowns. Gabe Marks caught 14 passes for 146 yards and a touchdown while River Cracraft had 8 catches for 121 yards and a score. The Rutgers defense was not able to force a turnover and the critical drive that led to the loss. The defense will need to improve if Rutgers wants to make a bowl game this year. The Scarlet Knights face Penn State on the road next week. Minnesota played well in week one and did so again in week two on the road at Colorado State. The Gophers needed overtime to get the win, but they were able to force an interception and then kick a field goal to give them the three point victory. Mitch Leidner’s stats are not overwhelming, but he played well when he had to for the most part. He went 23 of 45 for 233 yards with 2 touchdowns, but no interceptions. He did lose two fumbles with the first one occurring inside the Rams’ 20 yard line on fourth and one. The other happened inside his own red zone that led to a field goal. Still, his ability to lead the offense down the field late in the fourth quarter for a go ahead touchdown was impressive. Rodney Smith ran for 108 yards on 21 carries while Leidner was the second leading rusher with 47 yards on 11 carries. Drew Wolitarsky was a big target for Leidner with 9 catches for 114 yards and a touchdown. KJ Maye made the biggest catch in the fourth quarter for a touchdown and finished with 6 catches for 54 yards. The defense played well, especially when it counted the most in overtime. They finished with four turnovers forced and also held the Colorado State offense to 314 yards. The defense got lucky that Colorado State’s Rashard Higgins was out, but still did well overall. Minnesota’s strong start will look to be continued next week back at home against Kent State. If there was any worry that Northwestern would be too full of themselves after last week’s win over Stanford, it was not apparent in week two. The offense was far from overwhelming, but was efficient led by Clayton Thorson who went 11 of 16 for 152 yards and a touchdown. He also ran for a touchdown and only attempted two runs. Justin Jackson had 22 carries for 78 yards and a touchdown while Warren Long saw action and finished with 12 rushers for 72 yards and a score. Austin Carr had 2 catches for 61 yards and a long touchdown of 44 yards. Dan Vitale had 4 catches for 40 yards. The offense was not spectacular, but the defense was even if it was versus a FCS team. Matthew Harris had a big game this week with two interceptions including one returned 71 yards for a touchdown. The defense allowed only 138 yards of offense to Eastern Illinois and did not allow a third down conversion (0 for 11). It was another dominant performance that bodes incredibly well for the Wildcats. Northwestern will take on Duke next week on the road in another early season test for the Wildcats. Iowa had to battle against their in-state rival Iowa State, but they got the job done thanks to a balanced offense. Quarterback C.J. Beathard threw for 215 yards and 3 touchdowns on 15 of 25 passing. He also showed some wheels by running for 77 yards on 10 carries including long runs of 44 yards and 57 yards. Jordan Canzeri pounded the ball 24 times for 124 yards and a touchdown, but did lose a fumble inside the Iowa State red zone with the game tied at 17. Matt VandeBerg was a safety blanket catching 9 passes for 114 yards and a touchdown. The defense was not great in the first half allowing all 17 points, but they played well in the final two quarters. With the game still in the balance and Iowa leading 24-17, Desmond King intercepted a pass at the Iowa State 36 and put the offense in great position to salt the game away. One drive worth noting was Iowa’s final drive of the first half. They started from their own 2, moved the ball down to the Iowa State 22, and were in a great spot to kick a field goal. The game was a 17-10 Iowa State lead at the time, but Kirk Ferentz decided to try a trick play and let Marshall Koehn run the ball on a fake field goal, but he was stopped at the five. It was a bizarre play call that had no effect in the end, but the timing was very curious. Iowa has another good game next week with Pittsburgh going to Iowa City. 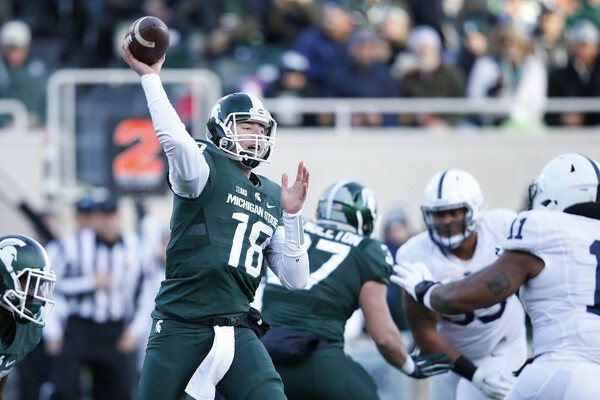 The Big Ten’s biggest game of the week turned out to be a good one that went their way with a nice performance out of the Michigan State Spartans. Connor Cook had a decent game going 20 of 32 for 192 yards with 2 touchdowns and an interception. Madre London had a good game running the ball with 103 yards on 18 carries while LJ Scott pounded the ball in for two touchdowns and 76 yards on 11 carries. Aaron Burbridge had a great game catching 8 passes for 101 yards and a touchdown. The Michigan State defense was not great, but they played well considering their opponent. They forced two interceptions in the first half with the first one leading to a touchdown for the offense. They also had a huge goal line stop in the second quarter. In the fourth quarter, they allowed a touchdown with a 31-21 lead, but were able to force a turnover on downs on the following drive (thanks in large part to a sack by Chris Frey and Lawrence Thomas). Michigan State will be back at home next week with Air Force coming to town. 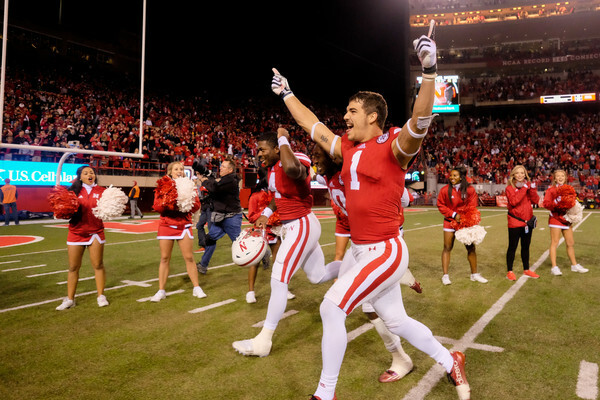 Nebraska rebounded from week one’s crushing Hail Mary loss to decimate South Alabama. Tommy Armstrong went 21 of 30 for 270 yards and 2 touchdowns to lead the Huskers. Terrell Newby had a monster game rushing for 198 yards and 2 touchdowns on 28 carries. Newby also had 2 catches for 38 yards and a score while Brandon Reilly caught 5 passes for 71 yards to lead the team. The defense was clearly angered by last week’s performance and did well with the starters in. They did not allow a point in the first half and when the Jaguars did get into scoring position, they stopped them both times. Nebraska faces the Miami Hurricanes next week on the road in another big game for them. Indiana escaped an upset last week against FCS Southern Illinois while this week’s game was not as dramatic at the end. However, Indiana did struggle early on with FIU. The Hoosiers trailed 22-19 early in the fourth quarter before putting up the final 17 points to make the finish comfortable. Jordan Howard had another very good game with 27 carries for 159 yards. The defense struggled at times, but sealed the game with a pick six for 96 yards by Jameel Cook. That happened to be on fourth and goal with just over 4 minutes left. Indiana’s defense will be tested again next week with the high-powered Western Kentucky offense going into Bloomington. That concludes a look at the second week of the Big Ten football roundup. Look out for the week three edition next week. Melvin Gordon‘s career-high 259 yards rushing were not enough for the Badgers overcome Northwestern on Saturday. Godwin Igwebuike had THREE interceptions in the Wildcats win in a game that featured both Joel Stave and Tanner McEvoy at quarterback for Wisconsin. The Badgers’ first drive started well with Melvin Gordon breaking loose for a 58 yard run to the Northwestern 36 yard line. However, it ended with McEvoy throwing off his back foot to Alex Erickson. Igwebuike was there for his first interception and a touchback to end the drive. The Badgers defense was stingy in the red zone after a long drive by the Wildcats. Jack Mitchell‘s 22 yard field goal make it 3-0. However, two drives later, Northwestern Trevor Siemian hit Dan Vitale for a 5 yard touchdown and a 10-0 lead. Wisconsin threw three straight incompletions after that. There would be no scoring for the rest of the half and the Wildcats led 10-0 at the break. Wisconsin started the second half strong, just as they have all year long. Melvin Gordon broke 61 yard run on the second play to the Northwestern 14 yard line. After Gordon converted a fourth and one at the 5 yard line, he ran in on the next play from 2 yards out to cut the deficit to 10-7. The Badgers’ reverted to their interception throwing ways on the next drive. Stave’s arm was hit on the throw and it was picked off by Jimmy Hall. The Wildcats capitalized on the next play with Miles Shuler running in from 16 yards out on the reverse to make it 17-7. Wisconsin had a chance to cut the lead to 7 but Rafael Gaglianone‘s 50 yard field goal was wide left. Northwestern went right down the field but was stopped in the final 5 yards again. Jack Mitchell tacked on his second 22 yard field goal of the game to take a 20-7 lead. Wisconsin had a great opportunity to close the gap at the Northwestern 3 yard line. Joel Stave dropped back and then scrambled towards the sideline. He pass was thrown right in the path of Igwebuike for an interception in the end zone to end another scoring chance. Stave found Kenzel Doe on the next drive to make it 20-14 Wildcats. Stave threw his third interception with less than 30 seconds remaining to Igwebuike, which allowed Northwestern to run the clock out. It was another dreadful passing performance by the Badgers, though the cloudy and rainy weather had a big impact on the passing. Joel Stave went 8 for 19 for 1 touchdown and 3 interceptions. Tanner McEvoy went 4 of 10 for 24 yards and an interception in a largely ineffective performance. Melvin Gordon’s 259 yards and 1 touchdown performance went to waste for the Badgers. He did all that on 27 carries for a 9.6 yard-per-carry average. Alex Erickson caught 4 passes for 45 yards. Kenzel Doe had 4 catches for 34 yards and a touchdown in his best game of the season. The Badgers will need to find consistency in their passing game if they are to threaten in the Big Ten West division. The Badgers have thrown for 50, 289, 112, 160, and 138 yards in their first five games, including Saturday. Gordon is up to 871 yards on 105 carries this year. His presence alone has made the Badgers far more competitive. On Northwestern’s side of the ball, Trevor Siemian went 15 of 29 for 182 yards and a touchdown. Justin Jackson ran 33 times for 162 yards in his best performance of the year. Kyle Prater caught 5 balls for 55 yards to lead the Wildcats. It is hard to ignore the Wildcats’ improved performances over the last two weeks. They defeated Penn State 29-6 in a dominant effort and have certainly put themselves in position to make a bowl game after finishing 5-7 in 2013. Wisconsin (3-2, 0-1) returns home next week and will take on Illinois (3-3, 0-2). Northwestern (3-2, 2-0) goes on the road to face Minnesota (4-1, 1-0) who had a bye this week.